I can hardly believe I’m turning 70 in a few days. Knowing my friends and family, they’ll want to express their love and friendship by giving me a gift and will want to celebrate the occasion. Now, as anyone knows who has made it to this age, our main purpose in life seems to be downsizing and getting rid of stuff. So, this year I wrote to my close ones to let them know that their love and friendship is all I need. 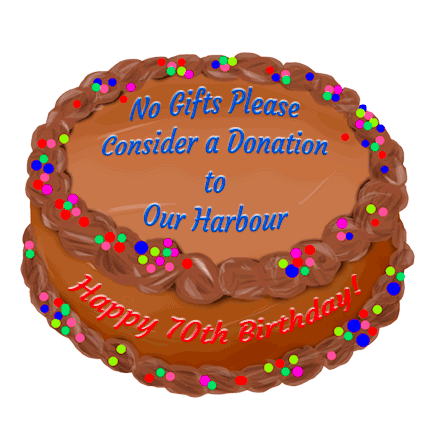 I also mentioned that if anyone felt they wanted to do something special, I would greatly appreciate a donation to Our Harbour and explained what Our Harbour does. Dolly was kind enough to prepare a sheet which she entitled “I would like to honour Linda Magher on the occasion of her 70th birthday”. The donor can include all the usual information (address etc.) which can be placed in a pre-addressed envelope to Our Harbour. Thank you so much, Dolly for your help. If Linda’s approach fits your needs, contact DG Dolly Shinhat at (450) 671-9160 to make it happen!